Tales Of A Nomad: Lepakshi...!! A bike ride was on the cards for a long time and I asked my travel buddy if she wanted to join. She was more than willing and we headed to this little known place called Lepakshi on a sunday early morning . I was on my pulsar and she on her activa and we left by 6 am. Lepakshi is off the NH-7 and we reached this place taking a detour immediately after crossing the Andhra pradesh border at Kodikonda. I had never travelled on NH-7 beyond the Bengaluru International airport at Devanahalli and that was the main reason for selecting this small temple village. The tarmac after the turning towards the airport was absolutely butter smooth and we had a splendid ride. I did push up the needle of the speedometer on my steed a couple of times to check whether it could still achieve the bradmanseque figures. However it wasn't surprising that the steed responded by cruising at my intended numbers. We had a small break for breakfast after Chikballarpur and then headed towards the Andhra border. The well laid out roads made us stop and take photos of the same. However the disadvantages of such roads is that you end up enjoying the ride and forget about the destination. Infact this is what happened to me too. I was enjoying my ride and completely forgot about the detour that had to be taken after the toll gate at Kodikonda. After about 5-6 kms from where we were supposed to take the deviation, I had this feeling that we had missed the point. I stopped and asked the next person whom I met on the road for directions to Lepakshi. However my broken Kannada couldn't help the situation and his Telugu was making things worse. However when I said Lepakshi, he muttered something in Telugu and showed me the direction with a wave of his hand. Sign language does help even in the 21st century...!! After turning back and reaching the junction, we took the turn and entered the village roads. This road leads to Lepakshi and on the way if your lucky enough you could spot painted storks. However i didnt see any. 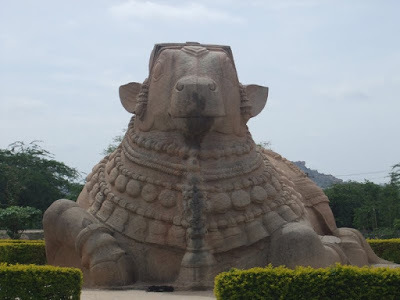 History says that Lepakshi is the location where Ravana fought with Jadayu after he had abducted Sita. Before you reach the Veerabhadra temple there is a huge stone structure of Nandi which is supposed to be one of the tallest in India. The Lepakshi temple has a lot of carvings, mural paintings and architecture which is a delight for both historians and photographers alike. This is a 16th century temple which was built during the Vijayanagara empire and the carvings on the pillars depict a lot of history. After a couple of photoshoots around the temple we entered the inner sanctum. The priest who was performing the pujas also acted as a stand-in guide as he explained to the devotees the history behind the temple and its formation. To my amusement he asked each devotee whether he was a Kannadiga or Tamilian or a Teluguite so that he could explain to them in their respective languages. Malayalam is a tongue twister language is what most people say and I am sure the priest would agree to it. It was time for us to leave and we headed back the same route. This time there was no missing turns and we hit the NH-7 through the semi-tarred village roads. Once back on NH-7 we were back to the zenith of smooth riding. Even though the sun was out we didnt feel the heat and we rode on and on till we touched the traffic-filled Bengaluru by afternoon. Lepakshi is a nice getaway from Bengaluru if you like architecture, history and beautiful roads. Though there isnt much to see other than the temple, the ride to the place will surely make anyone relaxed. Signing Note: Lovely tarmac doesnt always help the traveller, but it surely does bring immense joy to the rider. Would definitely want to visit this place once...Good description.. Thank you. Its definitely worth a visit. A pride for Rayalaseema people, this place was described very well by one /tamil write Jeyamohan. Liked your narrative and the stunning Nandi. Thanks for sharing. Thanks a lot. Yet to read Jeyamohan's writing. That was an interesting armchair tour-there is so much to see in our country that the thought is overwhelming & disheartening sometimes! Thanks a lot. You got to be excited about seeing all those destinations. Thanks a LOT for this beautiful post! without it I would have never known about any such place so close to Bengaluru. Definitely on cards though not sure how my kids below 9 will find it. Have visited this place.. it is indeed beautiful.... nice post! Great place with lot to see. It absolutely is a great place for heritage lovers. Heard a lot about this place...thanks for this detailed description..would like to pay a visit by the end of this year..